When this went on the list I was envisaging a day out in the forest en famille, good wholesome family fun, fashioning windbreaks with rows of sticks, a grassy reed roof, a carpet of moss… that kind of thing. A day spent creating a thing of magnificence, all from the rich resources that nature has to offer. But then opportunity knocked, and with less than 2 months to go, I opened the door with alacrity. It was a bright sunny day, we were playing in the garden, the kids had a friend round, I was desperate to knock off a few of the 100 but couldn’t leave the premises. Then suddenly, ‘Can we build a den mummy? In the garden?’ Indeed we could! Me and the youngest spent a happy half hour, fashioning an ingenious den. Two benches, a load of old bedding, some stones to hold it all in place; a carpet of hessian sacks, and then filled to bursting point with all the dolls and soft toys in the house. Perfect. Add a jug of juice and a few chocolate biscuits and that is a happy playdate, and can just about (if readers are minded to be generous) count as one of the 100. 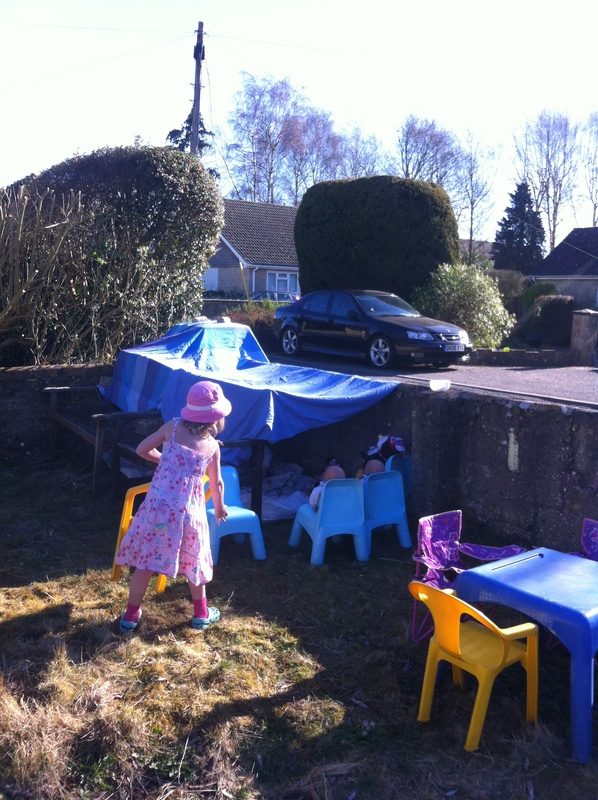 This entry was posted in creative, family, humour, new experience and tagged den building. Bookmark the permalink.